All steps to Safari and others. Please read the essential information before you book. Please read carefully. We accepts bookings subject to the linked conditions. Once you have decided which service you require, please fill following booking form and send us to check availability. We will forward to you a Confirmation Invoice if your requirement is available. 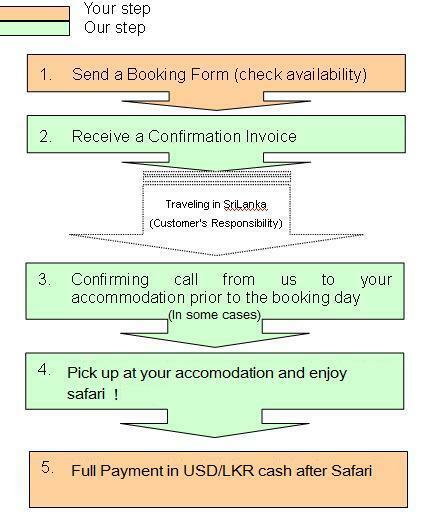 After your safari/camping/jeep hires, full payment on your Confirmation Invoice must be done directly to driver in USD or LKR cash. Rental Cycles, Mortorbike Hires and Volunteer & home staying fee must be paid in USD or LKR cash in advance. Guest House staying fee must be paid in USD or LKR cash when you check out. Please copy and paste the following booking form to your emailer and send us. * Please read the essential information before you book. Please reserve and reconfirm the above reservation and send a confirming invoice for payments. Copyright（c）2012 Samagi Villa Safari, All rights reserved.